This page contains a collection of videos that the Hoth Hoppers created during our trip in 2007. Feel free to copy and distribute, link, embed, etc... as long as you mention the source. You will also find 7 episodes of my Heading for Hoth panel - live on stage - at the Jedi Con 2008 in Düsseldorf (Germany). Enjoy! 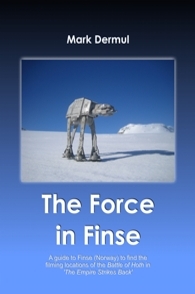 This is a short video to introduce the book 'The Force in Finse', the absolute must-have guide for any Hopper! This is a 10-minute compilation of our footage. The uncut videos can be found below. This is a 10-minute movie of uncut footage. The footage for these movies was shot by Christian Quast and Colin Kenworthy, two of the Hoth Hoppers. The book video was edited by Mark Dermul, the compilation by Colin Kenworthy.